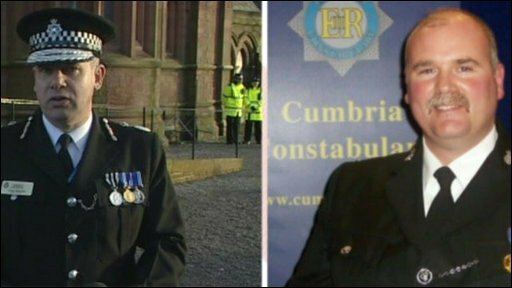 Cumbria Chief Constable Craig Mackey: "This is a very sad day"
Hundreds of people have attended the funeral of a Cumbria Police officer who died while helping others during last week's floods. Pc Bill Barker had gone to the aid of a motorist on Northside Bridge in Workington when it collapsed. The hearse was escorted to St Mary and St Michael's Church in his home town of Egremont by motorcyclists from the force's roads policing unit. Ten officers made a guard of honour as the coffin was carried into the church. 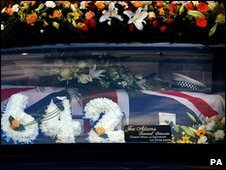 It was draped with a union jack with Pc Barker's helmet on top. Six officers and close personal friends acted as pallbearers. The service was attended by hundreds of friends and colleagues as well as family members. Mourners lined the streets of the town as the cortege passed. During the ceremony the Reverend Richard Lee, said: "Family, friends, colleagues, neighbours and those who knew him from afar have come together united in grief for the loss of someone special. "He affected people in so many ways." Witnesses said the father-of-four had gone to the aid of a car on Northside Bridge when it collapsed on 20 November. His body was later found on a beach 10 miles away, on the eve of his 45th birthday. After the funeral, Chief Constable Craig Mackey, said: "Today is a very sad day. "Cumbria Police has lost a dedicated and committed officer who spent 25 years serving the community of Cumbria. "He was clearly more than just a police officer, and the thoughts of everyone in the constabulary are with [his wife] Hazel, his four children and family and friends." Ray Cole, Chair of Cumbria Police Authority, said: "It was a privilege, pleasure and honour to work with Bill in my former role as an officer with the force. "He was greatly respected by all his colleagues, a dedicated officer and family man, and a true professional who loved his career. "He was an ambassador for the constabulary and will be missed by everybody." Outside the church, a statement was read out by Mrs Barker on behalf of the family. She said: "The last seven days have been the worst days of our lives. "We have to come to terms with losing a wonderful husband and a devoted father to our four children. "He was a committed man and put his heart and soul into everything he did, especially family life. "Our lives will never be the same without him. "We as a family have been overwhelmed by the support, messages and condolence and tributes we have received. "It is so comforting to know that Bill touched the lives of so many and you only have to look around you today to see how much of an impact Bill's death has had." Following the church ceremony, there was a private burial service at Egremont Cemetery.